The field for the general election is set. Almost. A few things remain unsettled as we march toward the Nov. 7 election, including how any write-in candidates fared and whether alliances and candidate endorsements will depart from the traditional pathways with any across-the-aisle overtures and offers of support. The outcome on the Democratic side of the Erie County Executive race featured no surprises. Incumbent Kathy Dahlkemper handedly defeated her opponent, Joseph Curlett, a 68-year-old retired state employee. Curlett, who worked at the state's Department of Community and Economic Development for a decade, earned 7,585 votes, falling well short of the former congresswoman's 16,301. Dahlkemper's Republican opponent, businessman Art Oligeri, isn't a newcomer to the campaign trail. He mounted a bid for County Executive in 2005 but lost in the primary election that year. A surprise to some was how tight the Republican candidate race for County Executive ended up being. Just 214 votes separated 64-year-old Oligeri from Brenton Davis, a 33-year-old private contractor. Although Oligeri took an early lead and held it throughout the night, the top three returns shuffled with Davis, Ed DiMattio, and Tim Sonney remaining in the mix. Davis, a newcomer to Erie politics, surprised some, rocketing upwards in the vote tallies late into the night, drawing in strong support from Erie County's outlying districts. DiMattio, a current County Councilman representing the 6th District, took third after Davis, earning 1,695 less votes than Davis did. After the official ballot count on Friday, May 19, Davis conceded to Oligeri, offering what seems to be his full and unwavering support. "My resources, my assets, my information, and my team now become Mr. Oligeri's," David told Erie Times-News' Nico Salvatori on Friday. "And we're just going to shift gears and move forward to ensure that the status quo ends and we don't have four more years of managed decline." As for the write-in results, the safer assumption to make (note: final results aren't in yet and are projected to be tallied in the coming weeks) is that it won't change the outcome. Rarely can a candidate create the necessary groundswell around a write-in campaign to outpace any of the names on the ballot. That leaves us looking at the results of two major races in the city: Erie City Council and Erie mayor. Amongst the crowded field of 16 Democrats looking to finish 1-4, political newcomer and former reporter and editor for the Erie Times-News Liz Allen garnered the most votes with 4,434, or nearly 12 percent of the total vote. Behind her, incumbent Councilmen Jim Winarkski and Casmir "Kaz" Kwitowski each earned nearly 11 percent of the vote, or 4,090 and 4,025 votes, respectively. Kathleen Schaaf closed out the winner's circle with 3,236 votes, or 8.66 percent of the vote. Schaaf, a teacher, and Allen are two new faces vying to join City Council. They're competing to fill the vacancies left by Curtis Jones, Jr. (who steps off of council due to term limits) and David Brennan (who, after filling the vacancy created by the death of Councilman Jim Thompson, went on to win one term but decided to step away from Erie politics). Winarski and Kwitowski sought reelection to keep their seats. Despite running in a more-crowded-than-usual field, the incumbents – although neither finished first in the vote count – won most likely due to name recognition and experience (and that they had political machines already in place and weren't starting from scratch). Allen's time with the Times likely gave her a boost – coupled with both her strong community presence and door-to-door strategy. Schaaf, who ran a quieter campaign than others, owes some of her credit to the luck of the draw: She was first on the ballot. Lone Republican Dan Nick will join the four Democrats in the general election when five will be whittled to four. The last Republican elected to Council, Denise Robison, was elected in 1990. That takes us to the big dance: The race to become Erie's next mayor. The match-up for Nov. 7: Democrat Joe Schember vs. Republican John Persinger. Both the night of and in the days following, most folks I ran into asked a simple question: Were you surprised by the results? My answer: No. And yes. Ever since the field was set, most analysts had Schember at the top along with two of his six challengers, City Councilman Bob Merski and County Councilman Jay Breneman. Most also had Persinger, the more conventional candidate, defeating Jon Whaley. In the lead-up to the primary, it was clear that both Persinger and Whaley care about Erie and want to take steps to build it back up. Both had messages of "ending the status quo" and both argued it would take change (heavy on the notion of electing a Republican instead of a Democrat, like Erie's historically done, to push such change) to improve the region. But Persinger is the Superman to Whaley's Dark Knight. Persinger's pedigree, a Harvard grad with a law degree from Notre Dame with time spent working in the White House, painted him as the more traditional option on the Republican card a la White Knight who dons the suit and comes off more polished. Whaley, who worked as an aide in the Sinnott administration's early days but left due to what he cites as philosophical differences, ran an unsuccessful write-in campaign against Sinnott in 2013, switched parties to run for City Council as a Democrat in 2015 but failed to make the cut, and ran a far less traditional bid for mayor this year with his gritty, rough-around-the-edges style. But that's not meant to sell Persinger short here. He's bright, he's active, and he's focused. 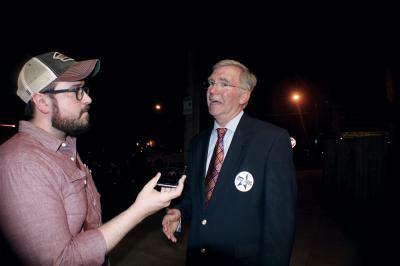 "They're hungry for new leadership in this city," Persinger told me about the people of Erie the night of his victory. "We put in a lot of hard work, going back to February, knocking on doors meeting with people and talking about their concerns, letting them know that they have a choice in this election, and people responded." Persinger's big on "choice" in the election for Erie's next mayor, adding that he plans to go across the city "from Pittsburgh Avenue to Buffalo Road to let people know they have a choice in this election. They can choose between the status quo and 60 more years of decline, or they can choose a brighter future. We have new leadership ready to go, and I think people respond to that message." Whether Erie will buck its historic trend remains to be seen. But what is clear is that if anyone has the will and energy to have minority-party impact, it's Persinger. "If we're going to be a thriving city in the future, we need a mayor who understands what the future looks like, and I'm ready to take advantage of that," he said. Although Schember didn't command a majority of the votes like Persinger did, his victory was decisive. His 3,764 votes represents 30.46 percent of the overall Democrat voter turnout. A near one-third get isn't a clock-cleaning, but the bell's been rung loudly. 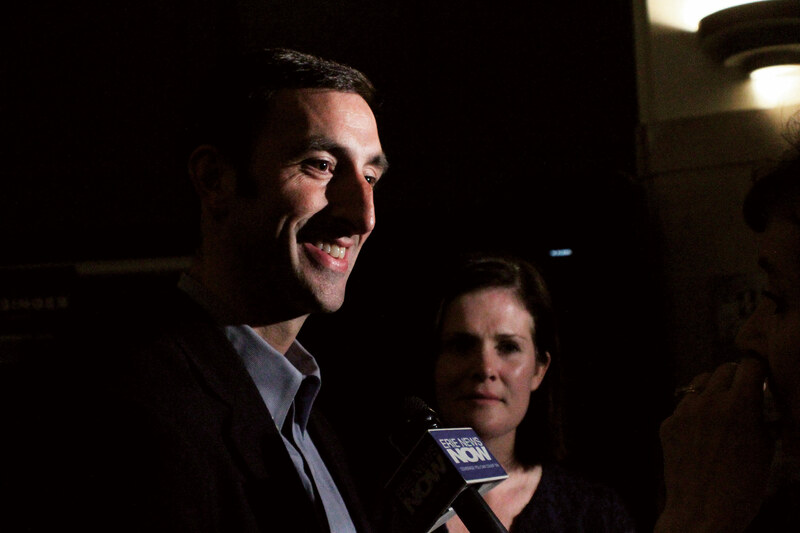 "We ran against six very talented people," Schember said on the night of his victory. "I want to work with them moving forward." Schember credits his ground game for his victory, noting that he knocked on more than 2,500 doors during the primary and plans to use a similar strategy in the general election. "A huge part of [the general campaign strategy] will be door-to-door because that made a huge difference today," he said, "and I just love doing door-to-door. "Not one person was rude to me," he added. "They talked to me; they recognized me; we had great conversations. That definitely helps a lot. If I get elected to be mayor in November, I want people to feel that they know me and have access to me. That's key." Like Persinger, Schember, too, is bright, active, and focused. "I want to help transform Erie," he said. "We have a once-in-a-lifetime opportunity to do that." And he acknowledges that it won't be quick and it won't be easy, citing the need to work with private development that's underway. "It's not going to happen overnight," he said of Erie's potential transformation. "It'll take 10 years, according to Erie Refocused, but I'm committed to leave a great city for the next generation." At the top of the pack but falling short to Schember were Merski and Breneman, who placed second and third respectively. Merski received 3,086 votes – or just shy of 25 percent of the overall vote, and Breneman garnered 2,421 votes – or nearly 20 percent of the overall vote. Polls and pundits had these candidates towards the top and the polls proved to be right. Not too far behind, Rubye Jenkins-Husband finished with 1,685 votes – or 13.63 percent of the vote. While she ran a markedly quieter media campaign, her name recognition (most likely from her time on City Council) landed her in the middle of the pack. So it's not a surprise that out of seven candidates, the perceived frontrunners finished in the top three with a well-known, well-liked candidate in Jenkins-Husband right behind. What is surprising is how the bottom, well, bottomed out. Together, the bottom three candidates didn't muster enough votes to match Jenkins-Husband. Franklin, who arguably ran the most austere campaign in the pack, finished last with 314 votes. Next, Clerkin clocked in with 518, and Austin closed out with 555. What's not surprising is that Schember and Merski, who spent the most at $111,000 and $109,000, respectively, finished first and second. TV and print ads, mailers, and billboards aren't free, and although some candidates may be able to attract voters with good ground games and strong debate performances, repeated images of candidates and their platforms across a variety of media rarely hurts and often helps. Where it gets interesting is that Austin spent $45,114 and finished fifth. Breneman spent less (at $39,729) and finished third. Jenkins-Husband finished in between them, spending the second-least amount amongst the seven candidates ($8,368). Clerkin, who was just shy of Austin's vote count by 37 votes, spent nearly $30,000 less than Austin did at $17,270. Franklin, who finished last, spent the least at $7,368. What likely hurt Merski the most was the crowded field and losing some key endorsements. The camp had fundraised well, they stuck to their message of people over politics, and Merski did pick up endorsements from police, fire, Lilly Broadcasting, and more. Although Merski can't solely be blamed for Council's approach to Erie Refocused or the city-county EMTA battle, he was president during the times both were critical conversations for Erie's future. Linking him to that reminds voters that he's tied to Erie's current condition and that if change is what is coveted, he's not the strongest choice. And three sitting City Councilmembers endorsed Schember over Merski. Although two are immediately on their way out the door (Brennan and Jones, Jr.), it still sends a message. "One of you will represent your party; the others will be voted off of the island. Show of hands: Who will support the Democratic nominee?" This will indeed be critical moving forward into the general election. In the primaries, it's easy – and often more effective – to keep the message simple. Candidates, especially when there are more than four, are looking to distinguish themselves from their competition without alienating the fringe. That is, appeal to your base but don't say anything too specific that could cost you votes in the margins. In the general election, it's different. It's one party against another. One candidate against another. With a lot of room to discuss details and specifics. And in Erie, as it stands, it's now a banker versus a lawyer. The second-oldest candidate in the race versus the second-youngest. Both will be looking to fortify their campaigns. How they approach those who lost on May 16 could be a decisive factor. If Persinger's able to sway either Breneman or Merski away from their pledge to support the Democratic nominee, it could help bring along a stronger coalition of the youth vote to his side. Breaking the bloc in any way could actually help. But if Schember is able to keep the party unified, the path to victory for Persinger remains slim solely based on registered voters. When dealing with any defeated candidates, when they're brought into the fold, so comes whatever baggage they bear that kept voters out of their camps initially. At the end of the day, though, political capital – and the machines that help mount it – is still capital. The biggest surprise this election (to the optimists) and non-surprise (to the cynics) was the voter turnout. Twenty-six percent of registered voters have led us to where we are today. Of the 67,599 registered Republican voters in 150 precincts, 17,250 ballots were cast, meaning that 25.52 percent of registered voters took to the polls. Of the 97,283 registered Democratic voters in the same precincts, 26,418 ballots were cast, meaning that 27.16 percent of registered voters took to the polls. Together, that yields an average turnout of 26.47 percent. Or, it means that slightly more than one out of every four registered voters determined what the field looks like headed into the general election. In my last feature, I wrote: Without a national headliner on the bill, though, anything greater than one-third voter turnout will be heralded as a "good" turnout. I wrote it a bit tongue-in-cheek since I don't think 30 percent is all that good. Turns out, we're worse than that. Perhaps the overwhelming presentation of options kept folks home. Perhaps there's some truth to what Mayor Joe Sinnott told Erie News Now's Lisa Adams following the primary election: "I think all elections are important in Erie's future, especially when we elect the top leadership, but the way it was portrayed, that this was times of crisis and things, it is not times of crisis, we're doing fine and I think people know that and I think that's why you saw the low turnout." Regardless, we are where we are today because of the proverbial yesterday. The proverbial tomorrows will be shaped by what we do with our proverbial todays. And as it stands, we have more than five-months' worth of them before the city of Erie decides who will lead it next. What candidates – and voters – do with them will say a lot about Erie for years to come. Ben Speggen can be reached at bSpeggen@ErieReader.com and you can follow him on Twitter @BenSpeggen.